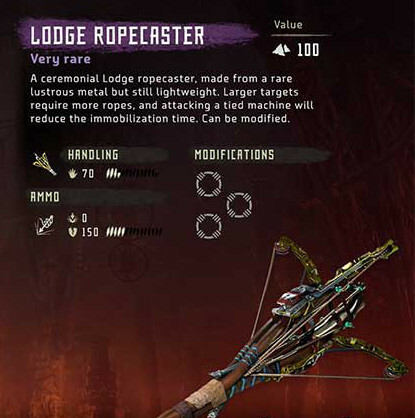 Lodge Ropecaster is a Weapons in Horizon Zero Dawn. A ceremonical Lodge ropecaster, made from a rare lustrous metal but still lightweight. Can be obtained by completing the hunting ground trials. In order to receive the full unique lodge weapons set (Lodge War Bow, Lodge Ropecaster, Lodge Blast Sling) you need to earn all 15 blazing suns. These can then be traded for the weapons at the Hunter's Lodge in Meridian.